WHY HAS THE TOPIC OF GOLF produced such a deep shelf of great books? 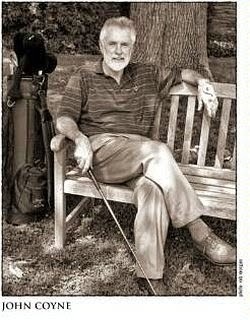 As someone who writes and reads golf books, I became curious why the game was so popular as literature. Yes, we all check scores of tournaments, online and in the sports pages, but we also turn to bookshelves and take down a golf novel or history of the game to read at night or on winter afternoons when there is no tournament on television. I see several reasons why golf is so attention-grabbing and addictive. The most obvious reason is that the topic of golf appeals to an audience that both love the game and appreciates fine prose. Players enjoy gifted writers like Bernard Darwin, Henry Longhust, J.P. Marquand, John Updike, and a dozen others who write knowingly about their sport and spin tales of information and enjoyment. Golf also offers a diverse field of subjects not possible with any other sport. Biography and general history are fertile genres for most high-profile games, but golf adds many other components: architecture, great matches, great courses, instruction, travel, and the long history of the game. Golf, too, is a mental game where we struggle, on and off the course, with controlling our emotions, managing the course, and swinging a club. All of that is fuel for a writer's imagination. Finally, golf presents challenges to players regardless of ability. We all have to handle a sand shot, play a utility wood over a pond to a small patch of green, or try and sink a downhill putt on a slick green. We are up against ourselves in our battle with the golf ball. We all face the same challenges regardless of what our handicap is. So we want to read how others players handle the same shot. Such a universal understanding by those who play the game allows us to relate to golf writing in a way virtually impossible with other sports, and allows a writer a wider range with which to converse, often deeply, with his or her reader. Given that, we turn to books to find answers about our swing, understanding of the game, and wisdom from other players, and if not that, we seek the simple solace of the printed page to calm our battered egos after a long day on the links. But where to find golf books which will smooth our egos and feed our image of the game, that's the question. Most pro shops today carry a few instructional books, some histories of the game, and perhaps a copy or two of Harvey Penick's Little Red Book. Home pros might be wise to build bookshelves in their shop. It could be a convenience for their members and another source of income. Beyond that, finding a bookstore is like looking for a lost ball in long grass. Seeking answers for myself, I have come across some amazing collections of golf books. One of the prizes, at the University of Chicago Library, a gift to the school by an alumnus and life trustee of the university, Arthur W. Schultz, is his special collection of golf books. Schultz, an advertising executive with Foote, Cone & Belding Communications, who was also nominated by President Reagan in 1984 to be a member of the President's Committee on the Arts and Humanities, gave 1,600 golf books to University of Chicago's Department of Special Collections, making it available to scholars. Another amazing private collection is the Sam Martz Golf Book Collection at the University of British Columbia. This collection has 4,730 golf books, which I believe is the biggest collection in the public domain. It was donated by Sam Martz, a retired Canadian meat packing magnate, to the university because he wanted it preserved in perpetuity. It is said to be the third or fourth largest in existence behind those at the USGA and Alaistair Johnston's private collection. One of the earlier collections of golf books in the twentieth century was created by C.B. Clapcott, a postal employee from England who died in the late 1950s. He sold part of his library to Colonel R. Otto Probst, of South Bend, Indiana. Probst's whole library of 6,000 books is at the PGA Historical Center in Florida. Another major collector is O.M. Leland, Dean of the Engineering School at the University of Minnesota. He donated his books to the USGA library in New Jersey. And, of course, pros, too, read and collect golf books. Ben Crenshaw is said to have at least 800 books in his home and his collection is still growing. My favorite collector of golf books, however, lives in the state of Washington. That's Peter Yagi. I like Peter because his books are for sale, and whenever I need a golf book for pleasure or historical facts, I check his catalog and there it will be. If you need something to read before your next round, check with Peter Yagi Golf Books at pete@moneytolend.com. You may not break par tomorrow, but you can enjoy a great author writing about the game of golf today.